Juan Carlos’s story of conversion and salvation encapsulates the array of stories gathered in this exciting and fascinating study of Pentecostalism and masculinity in the Dominican Republic by Brendan Jamal Thornton. Through the careful documentation of young men’s lives, he shows how men like Juan Carlos use the masculine credibility they learn on the street as “Tigueres” (macho men) to assert and reproduce forms of masculine authority through conversion narratives that assert their credibility as Christians, the macho being paradoxically reinvented as evidence of spiritual devotion. Thornton’s book aligns with a rise in studies on masculinity and religion, but it treads new ground by focussing on the contestation of Christian and Catholic identity in an area dominated by historically powerful, orthodox forms of religiosity. Thornton challenges this trend by providing an intriguing and in-depth portrait of Pentecostal identity in the barrio of a small municipal town called Villa Altagracia. Impoverished urban residents suffer from various forms of deprivation, but they are joining Pentecostal churches in increasing numbers, challenging the accepted Catholic hegemony. Thornton’s work plays a vital role in bringing attention to the negotiation of Christian identity in contexts beyond the Northern Metropole, illustrating how historic formations of Christian identity in the Global South are constantly reshaped by global socio-economic change. This work marks part of a more general trend concerning the rise of Pentecostal churches across the world. The influence of Pentecostalism over everyday Dominican life has gathered pace in recent decades, with Pentecostal memberships estimated to have increased by at least tenfold in the last fifty years. As Thornton shows, this rapid expansion marks not only how Pentecostalism is proving life-changing for its own converts but is altering irrevocably the nature of what it means to be both Christian and Dominican. In this context, one’s Christian identiy plays out along a series of historically configured binaries: local and global; orthodox or heterodox; insider and outsider; and so on. This bucks against several theoretical threads in the study of religion, especially notions of transnational religions invading local spaces. Thornton suggests that these local-global configurations can instruct us as to the nature of the local more directly as converts utilize their newfound evangelicism to radically reshape the terms of their Dominican identity. As he points out, this is especially the case for countries – such as the Dominican Republic – that are consistently and offhandedly glossed as “Catholic” without attentiveness to the complex nuances of Catholic identity in the first instance and the multiplicity of Christian experience and identity in the second. Thornton shows how Pentecostal converts draw on new repertoires of action, language and practice to distinguish themselves from their Catholic peers and demonstrate their credentials as a “Christiano.” In the Dominican context, the term “Christiano” is used for Pentecostal Christians in contrast to the more common “Catolico” for denoting Catholics, though, as Thornton notes, Catolico term can be much broader and often does not constitute active involvement in church life. On the other hand, “Christianos” are easily distinguishable, noted for specific types of behaviour rather than overt forms of religiosity: “They are known more for what they do (testify, preach and so forth) and for what they are prohibited from doing (drink, gamble, and so forth) than for any specific tenets of faith or, more frankly, for what they believe.” In the context of religious plurality, these performative markers become important points of differentiation for local Dominicans for whom discussions over how to be a good Christian are part of the everyday fabric of social relations and public discourse. On this point, showing how belief remains secondary to practice, he joins other scholars in urging for greater appreciation of the ritual quality of Pentecostal life and the subtle ways Pentecostal conversion reshapes belief via the body, rather than the other way round. Thornton is equally insightful about masculinity, offering carefully nuanced descriptions of the way young Pentecostals are forced to navigate between differing, and often opposed, models of masculine prowess. Here, he notes that youth gangs and Pentecostal churches share a number of characteristics: they offer “clearly lit paths for self-actualisation,” or rather, routes to empowerment and citizenship unavailable in the failing Dominican economy and national project; they offer sanctuary, security and affiliation in a world of chaos and competition; and they ultimately create alternate visions of both national identity and political participation which challenge the corrupt and violent Dominican State. However, as Thornton points out, while both the youth gangs and Pentecostal churches are shaped and influenced by global movements, economies and ideas, it is at the local level that young men join them and adopt their associated behaviours. On the street these multiply triangulated forms of aspirational masculinity are shaped by differing pressures and spaces of male performance. A number of his informants described being caught between maintaining the ascetic lifestyle required by the church and being a “man of the streets” or a “tiguere” where chief prerequisites include displaying “slyness, aggressiveness, carousing, womanizing, infidelity, and various kinds of delinquency.” Crucially it is at the intersection between the gang and the church that Thornton’s study offers most insight, showing how conversions from “tigueres” to “Christiano” is a deeply intertwined, mutually constitutive process. Thornton’s study joins a growing list of empirical work demonstrating that, contrary to popular narratives of religious decline in many parts of the world, religions are thriving and in some cases even expanding their influence in every domain of social, political and economic life. As recent studies have shown, evangelical strains of Pentecostalism are proving particularly resistant to processes of secularisation and in a number of contexts are generating innovative cultural formations with which scholars are struggling to keep pace. As he shows, even in a place so dominated by Catholicism as the Dominican Republic, Pentecostal groups can offer important alternative pathways to adulthood and social inclusion which can challenge dominant narratives of gendered identity. Through a carefully detailed ethnographic study Thornton has shed light on one such new outgrowth of evangelical Christianity, by charting the growing influence of Pentecostalism in the Dominican Republic, a locale previously dominated by Catholicism. In doing so, he has asked important broader questions about the politics of Christian identity in areas where multiple possible Christianities are vying for dominance or attempting to co-exist. Critically, his study traces how these new formations of Pentecostal identity are rooted in the locations, the street-corners and neighbourhood alleyways, from which their adherents originate. In many accounts of Pentecostalism in the Global North, class, gender and place are often overlooked in favour of a focus on spiritual and religious practice. Thornton challenges these accounts by demonstrating, through fine-gained ethnographic details, how one may go hand in hand with the other and, in this case, be mutually constituting. Not only does this offer important insights into the reasons for why young men mired in local cultures of Machismo might sign up to Pentecostal churches, but also why they might remain as part of the congregation over time. 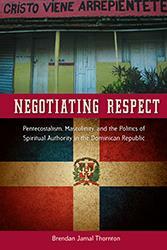 Negotiating Respect offers a rich and insightful ethnographic contribution to our understanding of Pentecostalism and masculinity in the Dominican Republic, and it provides valuable insight into how religion, masculinity and economic changes are reshaping specific places whilst being tied into vast, global movements. Ross Wignall is a lecturer in social anthropology at Oxford Brookes University. His research focusses on the intersection of morality, faith and the gendered body as modes of youth self-actualization with recent projects on the Young Men’s Christian Association (YMCA) in the UK and The Gambia, West Africa.